1. Get down on your hands and knees, with your hands under your shoulders and your knees under your hips, and place a dumbbell behind your right knee. 2. Flex your right foot, lift your right leg up, keeping the knee bent at a 90 degree angle, and squeeze the glutes. 3. Return to the starting position, repeat, and switch legs. Engage your core and keep your back, head and neck flat and neutral at all times. Breathe out as you lift your leg and squeeze the glutes, and inhale as you bring your knee back to the starting position. The weighted donkey kicks works the glutes and helps to lift and firm your backside. This exercise also tightens the abs, strengthens the hips and sculpts your thighs. 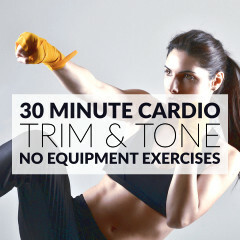 Do 2 or 3, 30 second to 1 minute sets on each side. 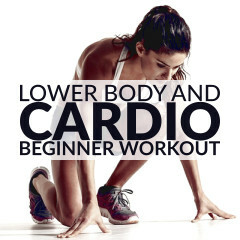 For a bigger burn, flex your foot and, at the top of each move, slowly pulse the foot toward the ceiling for 5 seconds.